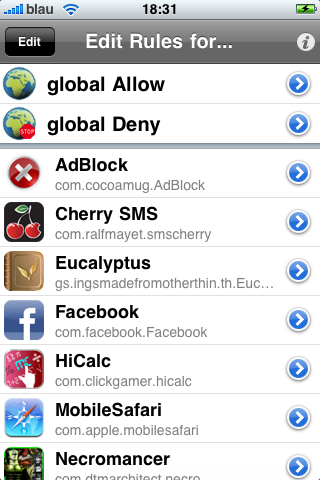 Decide yourself, Securtity for your iPhone and iPod touch Ony for iPhone OS 3.x Firewall iP allows you to block outgoing connections (TCP & UDP). It hooks into applications from AppStore and Cydia. Firewall iP will warn you if the app wants to establish a connection to a host and shows you the hostname. Then you have the options to allow/deny the connection once/always or allow/deny all connections for the application.